AOR, focusing exclusively on media research and consulting, conducts hundreds of media studies including a sophisticated, discrete conjoint analysis (a form of tradeoff analysis). We forced consumers to make trade-offs between various pricing, content and bundling options just as they do in the real world to help the The Buffalo News determine the potential to charge for its online content, the impact it would have on current users and the potential to attract new subscribers. 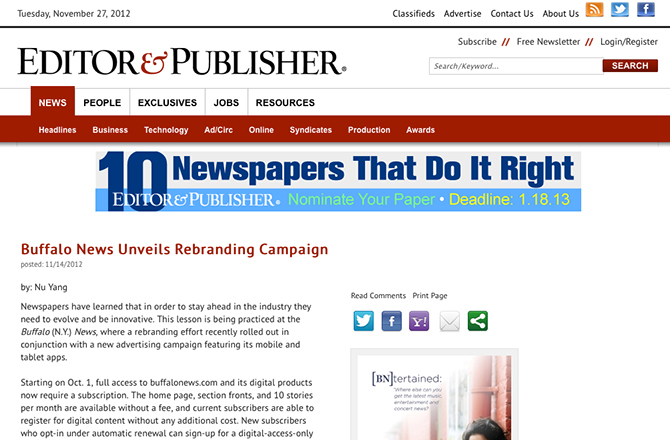 Using the “AOR Calculator”®, we determined the impact a paywall would have on the bottom line. Estimates were right on target. The result: a success, more paying customers and increased revenues.